3.0 release is changing the way you experience Plumbr in action. Together with the official 3.0 release scheduled to next week, we will also simplify Plumbr pricing. Both of these changes are based on your feedback, so we hope that you will enjoy the improvement. In order to experience the new look and feel, register here to get the latest release in your hands. Usability. In prior releases, after you attached Plumbr to your Java process, the monitoring part was pretty much invisible for you. After seeing tens and tens of support cases from users who successfully had attached Plumbr asking “What have I done wrong, I cannot see Plumbr anywhere” we knew that there was room for improvement. As of 3.0 release you’ll be able to communicate with Plumbr in the central service located at https://portal.plumbr.io. You will see there all your JVMs with Plumbr currently attached, current progress of leak discovery and all your prior leak reports in one central place. Licensing. The new release will also simplify our licensing. The main concern with our license options was the user-locked license, which our users found both confusing and problematic. Leak hunting usually involves several people from operations, monitoring and/or development teams. Our licensing forced these teams into a problematic situation where they (correctly) started to feel that they had violated license rules. So we decided to get rid of user limitation and only use the per-JVM pricing model. Additionally, we will also publish production JVM pricing and add an enterprise-wide roll-out support option. Free use – to be continued as is. 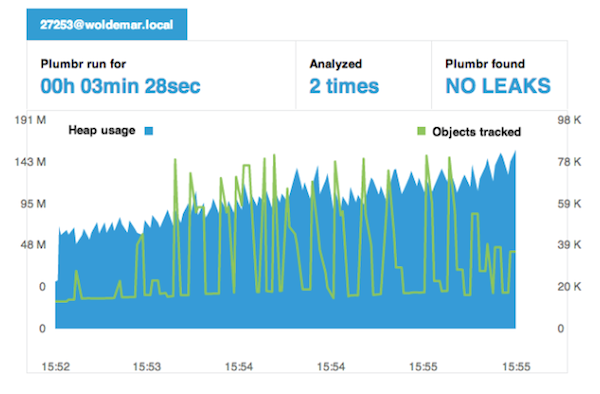 Fully functional version of Plumbr suitable for validating whether your application has memory leaks or not. When we indeed find a leak the free version informs you about the leak size. Further details helping you to fix the leak are available in paid plans. Single-user licenses. Discontinued as of 12th June 2013. So if this is the type of license you are into, grab yours fast before it is gone for good. Development license. We will lower the price to $499 per JVM per year. Usage of license limited to non-production environments. Production license. $1,299 per JVM per year. Can be used in all environments. Enterprise license. Bespoke licensing agreements crafted to your specific needs. Annual licensed that governs usage in the whole organization or part of its infrastructure. We are encouraging you to go ahead, register and grab your 3.0 beta release. If you find any quirks in the beta, let us know.